The cabinet scraper isn't just a tool for cabinetmakers. 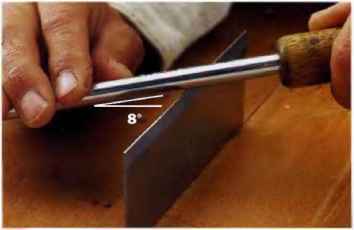 This simple metal blade can do away with almost all of the need for sanding in woodworking shops. As long as the cutting burr is sharp, the cabinet scraper will shave off paper-thin wisps of wood, leaving behind a glass-smooth surface that has no sanding marks. If you've never used a cabinet scraper, it's well worth investing a few dollars to try out this valuable tool. 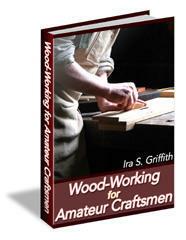 You may never go back to sanding again. 3With the scraper lying fiat on a worksurface, rub across the edges of the scraper with a burnishing tooi heid at a very slight angle. If you don't have a burnishing tooi, any piece of round hardened steei (iike the top of a chisel shank) wiii do. The edge of the scraper shouid be set back just slightly from the edge of the work-surface to prevent you from burnishing at an angie that's too steep. 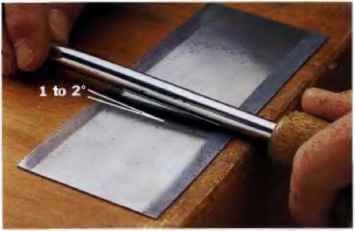 4Scrape across the edge of the scraper with the burnishing tooi, holding the tooi at an angle of about 8c.Thls will create a slight burr that accomplishes the cutting action of the scraper. 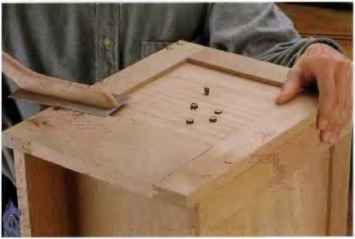 Create burrs on aii four edges of the scraper, flipping the tooi as each edge becomes dull. SCREW HOLE COUNTERBORES can be plugged with matching wood plugs or with contrasting plugs that give the project decorative flair, as above.